The artworks displayed in the two exhibition rooms are characterised by a construction of “communication” between the different components. Both artists living and working in Vienna and responding to new conditions of surveillance and hypervisibility in their works. This may lead to the deconstruction and questioning the medium itself and provoke confusion between illusion and testimony. A subtly exhibition links personal histories with wider cultural and political issues from different perspectives. Digital Control mechanisms are the central theme of Croatian artist Ivica Capan in his first solo exhibition at galerie michaela stock. Capan is using mass media images and gives a critical observation of today’s world. Candid challenges the viewer’s expectations of art and what the future of internet might be in light of a broader assimilation of digital technologies. His work contains thematic references to art history, literature and popular culture and he examines changes that digital technology has wrought upon conceptions of space, time and culture. The young Ukrainian artist Alina Sokolova rebels against the law and institutions of power and masters the expression of space and time. 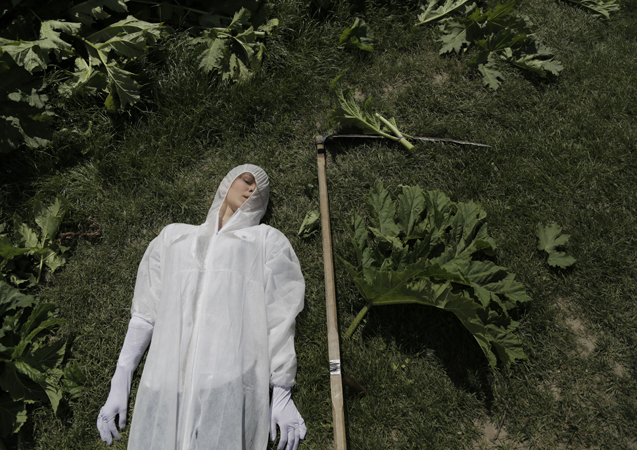 In her installation Heracleumfall she tells the stories of the poisonous plant Heracleum Sosnowsky, its role in society and its historical background as well as her personal connection to it. Popularly the plant is called “Stalin’s revenge” and it`s an ideal metaphor for ideological intoxication. Because once the poisonous stem is cut down, overnight it grows with even more persistence. In different performative acts Sokolova cut the plant several times down, smuggled it over the border and tried to reanimate the dead plant.